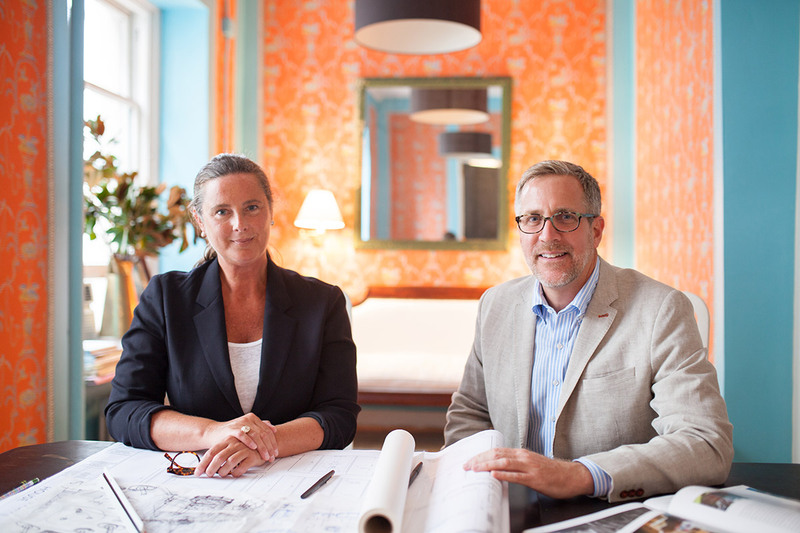 BILL BROCKSCHMIDT AND COURTNEY COLEMAN bring to their work a focus on traditional detailing, proportion, materials, and craftsmanship in furnishings and architectural elements. Whether designing a stylish library in a Park Avenue duplex or specifying intricate upholstery details for a 17th century wing chair for a Pennsylvania horse farm, the two emphasize appropriateness and clarity in their work, bringing a modern sensibility to historical references. The two formed Brockschmidt & Coleman, LLC, in February of 2001. From their office in the Flatiron District of Manhattan, the firm manages projects in locations in New York and the Northeast and throughout the South, as well as Bermuda, Sicily, and Croatia. In early 2019 they will open their southern studio in the Garden District of New Orleans. Their work has been featured in Elle Decor, House Beautiful, Veranda, Architectural Digest, Traditional Home, The Classicist, and on HGTV. Brockschmidt & Coleman are included in Elle Decor’s A-List as well as House Beautiful’s Next Wave Network. They have lectured at Winterthur, The Institute of Classical Architecture & Art, Southern Style Now, The American College of Building Arts, and the University of Notre Dame. Courtney holds a degree in architecture from Mississippi State University. She serves on the Board of Directors of The Decorators Club, where she founded the Centennial Design Competition for New York City area design Students. Bill received degrees in architecture from the University of Virginia and the University of Illinois at Chicago. He initiated the travel programs for the Institute of Classical Architecture & Art and remains active in the travel committee. Both Bill and Courtney are Fellows Emeritus of the Institute of Classical Architecture & Art for their years of service.